Hon. Paul Martin (left) and Rt. Hon. W.L. 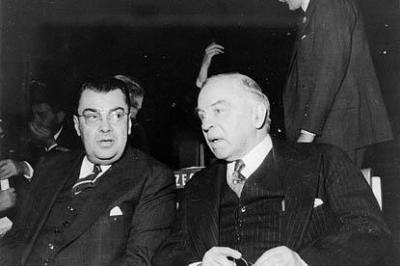 Mackenzie King attending the opening session of the United Nations General Assembly, 23 October 1946. The road to creating the 1947 Canadian Citizenship Act was paved with good intentions. Unfortunately, it barred many of the most deserving Canadians the right to call Canada their home. Paul Martin Sr., the father of former Canadian Prime Minster of the same name, minus the suffix, didn’t know he was on a quest for a symbol to represent "the character of Canada", but he found one, nonetheless, in a graveyard in northern France on a dull, chilly day in February 1945. Canada’s multiculturalism and the mythology of the mosaic — the strength of collective and diversity — were essential to Martin’s idea. Except they weren’t — they were British nationals living in Canada. It said so on their graves. Martin returned to Canada and drafted what would become the first Canadian Citizenship Act. As Martin saw it, even though Canada had been an independent state since 1867, forging Canadian citizenship was as fundamental to nation building as creating a distinct and unique Canadian flag. A flag and an anthem: the kinds of symbols that many Lost Canadians now have mixed feelings for. Though probably not the intention, the language of Martin’s first Citizenship Act, community, autonomy and pride, denies citizenship to people who on every commonly accepted level are Canadian. In fact it denies the children of many of those who fought and died to fill the fields Martin Sr. so somberly reflected upon.